The injured sea lion resting in the center’s ICU pen. 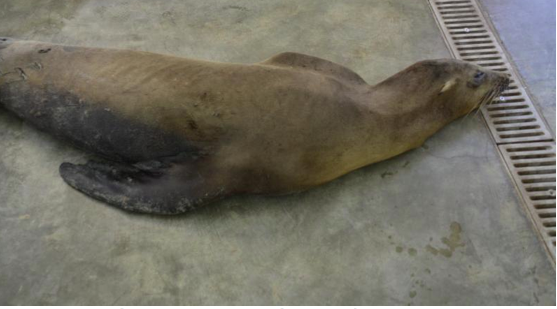 An injured sea lion that had evaded rescuers in Dana Point Harbor since last week was successfully picked up Wednesday, Sept. 6, by the Pacific Marine Mammal Center, but the animal was ultimately euthanized due to the severity of his injuries, officials announced. severe injury to his hind quarters. The initial cause of the injury is still unclear, but several reports from the public and rescue teams, as well as photos, show that a green mono-filament line may have been the initial cause, Executive Director Keith Matassa says in a statement. The entanglement inhibited the sea creature’s mobility to evade predators. There are indications that the sea lion was attacked by a shark, which contributed to the grave injuries, the statement says. PMMC veterinarians, the animal care director and rescue staff did an extensive physical on the animal upon its arrival at the center in Laguna Canyon.